Much of the attention generated by the demise of Cecil the lion appears related to the fact that he was a member of a charismatic species, that his species is threatened and the nature of his death. But now that Cecil, a resident of Hwange National Park in Zimbabwe, is gone how do we ensure that such events are not repeated? It is not as simple as banning hunting. Trophy hunting, or the selective removal of animals from a population based on a desirable trait, is a deeply polarising issue. Ethical standpoints against the deliberate killing of animals for sport are what drive the public response that we now see. Biologists have concerns about undesirable evolutionary outcomes that may arise from the killing of ‘prime individual animals. These animals are typically males that exhibit a desirable trait, like a large mane. Conservationists, have concerns that hunting may cause inbreeding, or drive rare species’ populations in isolated protected areas to the brink of extinction. Despite the controversy, trophy hunting remains a legally sanctioned activity in most African countries. That is because hunting generates income. Sportsmen and women visiting Africa contribute as much as USD 201 million a year directly through hunting. This is excluding economic multipliers. And safari operators are custodians of at least 1.4 million km2 of land in sub-Saharan Africa, exceeding the area encompassed by national parks in those countries where hunting is permitted by over 20%. Conservationists recognise that trophy hunting contributes to the protection of land from other uses such as pastoralism, where ecotourism is unviable. Bans on trophy hunting in Kenya, Tanzania and Zambia have been associated with an accelerated loss of wildlife, not the other way around. The halving of Africa’s lion population over the past 20 years is not the result of trophy hunting. African lions have declined through the classic drivers of extinction, namely habitat loss, human-wildlife conflict and disease. Cecil was no ordinary lion. Reportedly aged 13 years old, he was well past the normal breeding age for males of his species, what we term senescent. 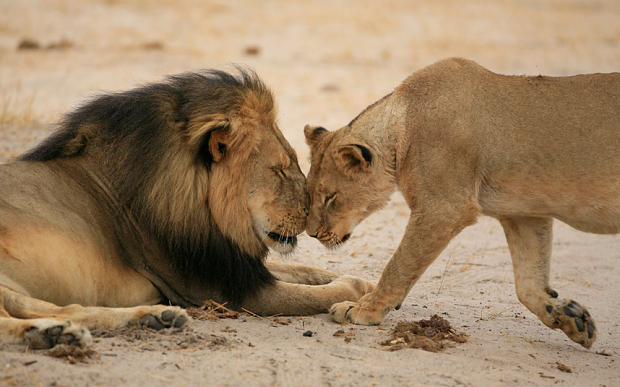 Male lions only gain opportunities to mate after taking over pride ownership after at least five years of age. They may hold tenure for between two and four years before being displaced by younger males. Cecil should thus have completed the genetic contribution that he could be expected to make before he was shot, and could not have been expected to live much past 15 years. Why then had Cecil remained a breeding pride male for so long? One reason may be that the younger males that would have contested pride ownership, had been removed by hunters operating in lands neighbouring the Hwange National Park. Indeed, the Oxford University researchers who had been following Cecil’s life performance reported that 72% of the males they collared within the national park had been killed by trophy hunters, and 30% of those males shot were under four years old. In this way, hunting taking place legitimately on land outside the formally protected area is prejudicing not only scientific research, but also the role of a flagship national park in protecting viable populations of large carnivores. How should this conflict be resolved? If the professional hunter and his client broke the law, then let the Zimbabwean legal system take care of that. More generally, how do conservationists trade off the money generated by trophy hunters against the huge costs of maintaining protected areas? What restrictions should be placed on where hunting takes place so that opportunities to draw candidates for hunting out of protected areas using baits placed outside their borders are prevented? The traditional boundaries drawn on maps from parks and zones where these animals are need to be re-assessed. They need softening and buffer regions where hunting is not allowed. Alternatively, areas effectively protected within the park should have non-poaching activities that people can enjoy. Perhaps the activities in the buffer zone could be foot safaris, providing the excitement of encounters with wild animals without the destructive outcome associated with hunting. The worldwide emotional response to the killing of this eminent animal could potentially lead to more effective reconciliation between the legitimate contributions that hunting can make to conservation, and the efforts to set aside sufficient land in protected areas to ensure the long-term persistence of the species these areas are supposed to protect. Whatever the outcome following the death of Cecil, an emotive, uncompromising standpoint around the ethics of trophy hunting alone will not assist the conservation effort in Africa. In fact, it may well have the unintended consequence of undermining it. Lochran Traill is Research Fellow, Centre for African Ecology, Animal, Plant and Environmental Sciences at University of the Witwatersrand. Norman Owen-Smith is Emeritus Research Professor of African Ecology at University of the Witwatersrand. This article was originally published on The Conversation. Read the original article. We have now come to a point in history in which vastly declining tracts of wild habitat, rates of extinction, climate change, and the many other impacts of human civilization on the world are such that killing animals for recreational purposes has to seriously be questioned. In my view, it’s time this practice ended. Moreover, we need to greatly amp up our efforts to protect what wild life and relatively intact habitats still exist. This isn’t to say that in cultures, particularly indigenous ones, that rely on wildlife for food or religious, ceremonial, or other cultural purposes, should be prohibited from doing so. It also isn’t to say that where animals are overabundant (frequently as a result of various anthropogenic factors) that they shouldn’t be culled to protect the larger ecological balance. In many cases this means tangibly assisting third-world countries like Zimbabwe with economic alternatives so that conserving wildlife is seen as better and more remunerative than allowing people to slaughter them for fun. This activity persists in large measure because hunters, like Palmer, pay substantial fees to kill, whether it is lions in Zimbabwe or polar bears in the Canadian Arctic. There is, moreover, another salient issue at play here. From ancestral times (underpinned in some cultures by religious beliefs, such as texts in the Abrahamic tradition) there has been an abiding belief that the planet and all it’s living denizens were simply given to humanity to do with as they pleased (i.e., kill for sport if so desired). On an economic level, this thinking manifests itself as extractivism. A growing number of ecologists and environmentalists – as well as many aboriginal peoples – believe that that must change (see, for example, the Law on the Rights of Mother Nature, now a part of the Bolivian constitution). The essential point here is the recognition that living creatures should be recognized to have a right to live, exist, and prosper quite apart from any value they may or may not have in relation to human civilization. Thus, rather than exercising dominion (in a Judeo-Christian sense) over the natural world, that humanity should shift its stance to be a steward of the natural world. In such a system of jurisprudence, killing animals for pleasure is an affront to the laws of Mother Nature.